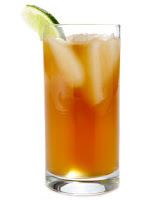 The Dark 'N' Stormy is often described as Bermuda's National Drink and is an intoxicating blend of Bermuda ease and British Colonial panache. I first tried this drink , not in Bermuda but at The Cloister at Sea Island, in the River Bar. This neo-classically cool drink is a great way to quench your thirst on a hot summer night. Combine the rum and ginger beer in a Collins glass filled with ice cubes and stir. It is very important to use Goslings and Barritt's if you are seeking the authentic Dark 'N' Stormy, if not, any dark rum and ginger beer will work. This entry was posted on 7:43 AM and is filed under Bermuda , cocktails , Dark 'N' Stormy . You can follow any responses to this entry through the RSS 2.0 feed. You can leave a response, or trackback from your own site. This sounds wonderful ~ will have to give it a try this weekend! My Mother and I went to Bermuda, I was pregnant! What a pair were we... I missed out on this drink, perhaps I will plan a trip to go back and try this refreshing drink. What has caused the current resurgence, do you know? I keep hearing about the Dark 'n Stormy lately; there have been a lot of mentions in the Washington Post over the last few weeks. I will need to give it a try! Sounds like a nice drink. I think I'm mixing some drinks tonight for "Girl's Night!" Ohhhhhhhh, I have to ask my Mom if she had one when she was there. Sounds delicious! Thank you for your wonderful comments. I am not exactly sure what has caused the sudden resurgence, I know that there are have been some legal and trademark issues going on. Other than that, I am not certain, but I am pleased that this great drink is growing in popularity. Ah, the Cloister at Sea Island! I attended the most fabulous wedding there last Spring. It's one gorgeous spot. I would love to be sitting under the stars, sipping on a Dark 'N' Stormy right about now. So happy to have just found your blog. I love it! And I have to say that Dark n Stormies are my favorite cocktail! Making sure you use Gosling's Rum and Barritt's Ginger Beer is key. We just spent a week on Cape Cod and made them almost every night! They have great dark n stormies at Wicker Park in NYC too!